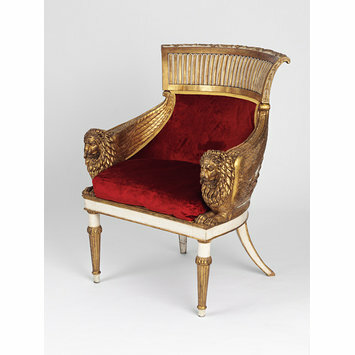 This armchair, of throne-like proportions, was made in about 1800-05, almost certainly in Rome. 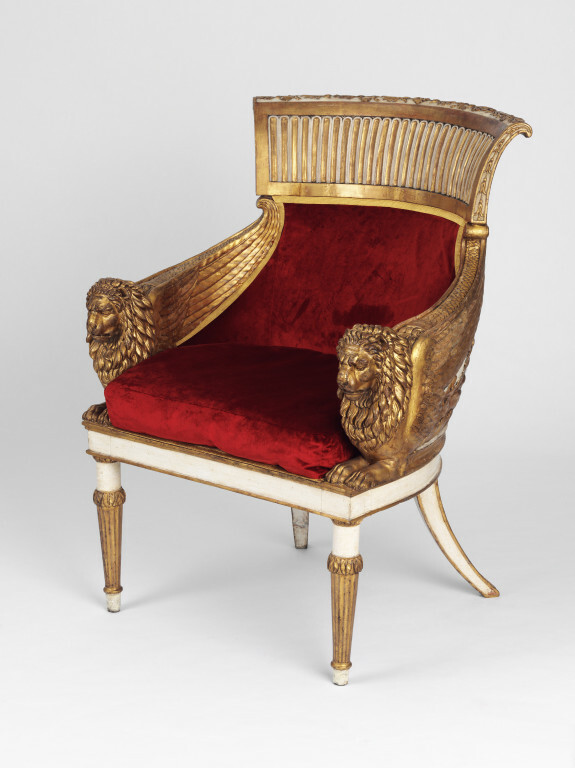 The form of the chair, flanked by crouching lions, is derived from classical Roman models and was used throughout Europe between 1800 and 1820. Lions symbolised wealth and power and had been used on thrones since ancient times. An old label in German describes it as ‘Napoleon’s throne chair’ and records that it was taken from Versailles in 1870, which may be true, as France was invaded by Germany at that time. The underside of the chair is also stamped with several numbers that must relate to inventories, but none of these has been identified. Throne chair. Walnut carved in relief and covered in gesso with gilt decoration on a cream ground. Currule form with solid back decorated in gilt relief on the reverse with a design of palmettes and foliated stems in a symmetrical 'Grecian' style. Broad concave top-rail with fluted decoration. Gilt arms in the form of winged couchant lions. Straight fluted front legs, and backward-curved back legs. Back upholstered in red velvet, loose cushion seat. The construction of this chair is unusual and is mostly concerned with providing large areas for carved decoration on the back and side. The legs and seat-rail are constructed in the standard fashion, the curved rails tenoned into the blocks cut at the top of the legs, the back legs continuing to the full height of the back, to tenon into the underside of the narrow top-rail, which is the depth only of the curved, top section of the tablet back. This basic structure gives the chair stability. The back and sides are of coopered construction, with narrow sections of wood set side-by side, presumably tenoned into the top of the seat rail at the bottom and into the underside of the top-rail, and glued together. The lower edges of these can be partially seen between the upholstery frame and the sides of the chair underneath. They appear to be of a lighter coloured, featureless wood, possibly lime or poplar, and this would reduce the weight of the chair. The carving on the back and lower sides appears to be cut into these sections. The lions at the front of each arm are carved from large blocks, presumably of walnut. The wings running back from these on both arms, inside and out, appear to have the grain running horizontally (as would be logical) and to be applied to the face of the upright narrow elements. It is likely that the tops of the arms are faced with a separate, thin fillet of wood, as carving and gilding into the end-grain of the upright narrow sections would be extremely difficult and it would be unlikely to achieve so good a finish. A separate upholstery frame has been added underneath, in mahogany. Shaped side pieces appear to be cut with a lap-joint to engage with the blocks above the front legs. The frame is also screwed (with large, machine-made screws) from the side into the back of the side frame on either side. The backs of the side frame pieces are cut with lap-joints to engage with the shaped back section, which sits down on to them and is now secured with large machine-made screws from the underside. This frame was probably added because of the difficulty of adding upholstery to the back rail of the chair, because of the coopered construction that leaves no obvious place for the attachment of upholstery webbing. In handwritten ink inscription on label, attached to the centre top of the back of the chair. A label claims that the chair was taken from the Palais de Versailles by Prussian troops in 1870. The form of the chair with winged lions flanking its back is derived from antique Roman models and enjoyed European popularity from about 1800. The chair was given to the V&A by Queen Mary. Her private secretary wrote ' In 1938 the late Sir Arthur Cope presented to Queen Mary a Napoleonic throne chair, and Her Majesty offered to lend it to the Victoria and Albert Museum with a view to making a gift of it to the Museum eventually. As, however, the chair had previously been exhibited at the Museum, on loan from Sir Arthur Cope, it was thought that it might hurt his feelings if Queen Mary lent it again after he had presented it to her...Her Majesty now commands me to say that it will give her much pleasure to present this chair to the Victoria and Albert Museum...The description in my records is, 'Throne chair formerly the property of Napoleon I, which was looted by the Germans in 1870 and eventually came to the German embassy in London. Sir Arthur Cope, R.A., purchased it at Christie's and, in April 1938, presented it to Queen Mary'. I also have the original label found on the chair...'. When the chair was reupholstered by the Museum in 1966, a fragment of braid and a fragment of upholstery found on the chair were accessioned: T.8&9-1966. The chair was again reupholstered by the Museum for the opening of the Europe Galleries 2015. Throne chair, carved walnut, painted and gilded, Rome, Italy, about 1800. The form of this armchair, flanked by crouching lions, comes from classical Roman models. The design was used across Europe at this time. Lions symbolised wealth and power and had decorated thrones since ancient times. This chair was never used as a throne, but it shows the way in which furniture designers adapted the symbols and forms of past civilisations.